I'm sulking, Flopsy Girl is sulking, we are sulking. Yesterday, we were given our food REALLY early. I just thought GREAT, but Flopsy Girl said, "I don't like the look of this", and of course she was right as usual. The 2-foots went out at lunchtime, AND DID NOT COME BACK UNTIL MIDNIGHT! There were no treats, no cuddles, nobody to annoy, IT'S JUST NOT GOOD ENOUGH!!! Plus, they STILL have not taken Flopsy Girl to see Auntie Francis (the best bunny vet in the world), although they MUST have realised that Flopsy Girl needs her teeth seeing to. They obviously no longer love or care for us, and I'm afraid that they are going to let us starve. I have already wee'd on the carpet to show my contempt. Good for you! Just because they let you be free range all week, those 2-foots can't possibly think they can get away with abandoning you for a whole day. Must keep those 2-foots in line. 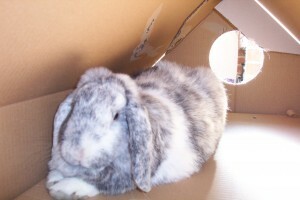 Perhaps Flopsy should leave another poo in the shoe to make sure her teeth are sorted out soon. Well really, these 2foots of yours are really taking advantage of yours and Flopsy Girl's good nature! This is getting ridiculous. It's all very well being free range but at least one of your 2foots should really be on hand to pamper to your every whim at all times!